'JUI-F wants to move forwar­d with the peace negoti­ations togeth­er with the other partie­s,' says Fazl. 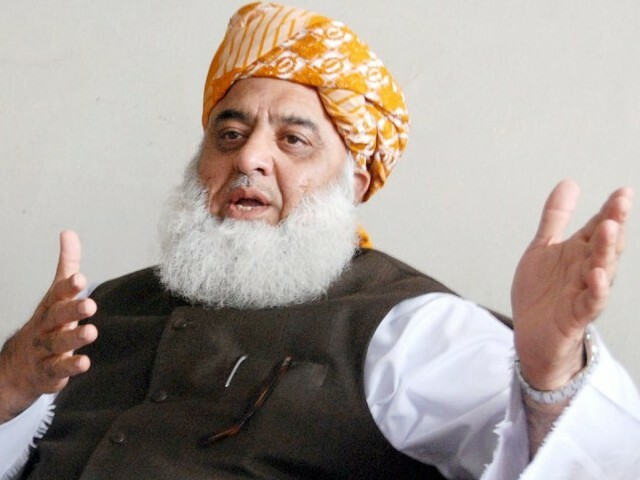 ISLAMABAD: Jamiat Ulema-e-Islam-Fazl (JUI-F) chief Maulana Fazlur Rehman, while talking to the media in Islamabad on Tuesday, stated that anyone killed by the United States, even if it is a dog, is a martyr, Express News reported. He said this when he was questioned regarding the death of the late Tehreek-e-Taliban Pakistan (TTP) leader Hakimullah Mehsud who was killed by a US drone strike on November 1. “JUI-F wants to move forward with the peace negotiations together with the other parties,” he added. “We will do anything for the country,” he further stated. On November 4, Fazl had said that in the wake of drone attack that killed Mehsud, a national strategy should be crafted. The JUI-F chief had stated that the last All Parties Conference had adopted a national stance towards reconciliation and decided to hold talks with the Taliban. “The drone attack has now changed the situation, which is why we need a new APC to review the situation. We were trying to get Pakistan out of crisis but the drone attack has increased instability,” Fazl had remarked. He had said that Pakistan Tehreek-e-Insaf’s ‘solo flight’ will damage national unity on drones and dialogue with Taliban as such party politics should not be based on point scoring. Fazlur Rehman’s statements are in support of Jamaat-e-Islami ameer Munawar Hassan’s comment that Hakimullah Mehsud is a martyr. The MQM chief Altaf Hussain issued a statement on Monday, saying that it is condemnable to call Mehsud a martyr and other politicians including Bilawal Bhutto Zardari were also critical of the JI leader’s statement. Confusion surrounds fate of TTP chief Hakeemullah Mehsud with some security officials saying he is dead, but TTP deny. Wants K-P government to issue executive order. KP Assembly will review killing of Hakimullah Mehsud and closure of Nato supply routes. and those who are killed by these martyr? Martyr!! Is he on Crack? This is an unforgivable insult to those thousands of women, children, Our Officers and Jawans, Martyred at the hands of these mercenaries..
Good, now go show your “love” for Pskistan. Dare to stand in Waziristan? And those killed by the TTP are not? US please shoot this guy too, one more martyr. We can not justify the drone attack. Although the reputation of Molana is not good, but the Statment is very much calculated. Now every leader in pakistan contesting for promotion as ‘Captain of TTP’. He should be hanged just like Bangladesh to JUI. while india gears up for the mars, we are crying for ‘martyr’ terrorist . .shame shame, my heart is crying! But what about diesel from U.S. ? Sad fact is that most Pakistanis would agree. No one can save Pakistan. Can someone on this earth explain me what to call an army guy in the battlefield? and what that army guy standing on the top of ice caped mountains would feel hearing this? Really, if this is what is coming from mainstream parties, you get a feeling that Pakistan doesn’t stand a chance in this fight against terrorism. He must have travel ban all over the world! US should sanctioned him and declare him as a terrorist. Wikileaks revealed that this guy was trying to negotiate with the USA so that he could become PM. What does that say about him? There is no proof ever produced by any one of who is TTP, where is TTP, who is their leader and whether they are involved in anything or everything? All Media Gimic ! Look at his maturity! He is insulting Islamic teachings! If he is given some more money he will say the other way round! I think we need another drone strike. It was the same US who funded the so called Afghan JIHAD against Russia. Martyrs, like the Soviets who fought in Afghanistan?! India please send this guy to Mars on your next attempt. Kindly make a distinction Not all people from US are bad. also this comment is beyond logic. perhaps the dumbest one. Maulana Fazlur Rehman stated that anyone killed by the United States, even if it is a dog, is a martyr. What a short memory Pakistanis have, I’ve learnt after reading the comments from most of the people. Martyr or no martyr, the objection of most parties is to bomb inside a country on a peace jirga that all parties including Prime Minister of Pakistan had been pushing for to happen for PEACE not war, not killings, for Pakistani people. For once in the history all political leaders agreed to it, which could not be digested by US of A. It is a slap on Pakistani’s PM face, only if you realize. It is not about if Mehsud was a martyr or not, it is the fact that USA crosses the limit and does what it wants inside the Pakistani premises, be it the RAMBO of CIA on Lahore mall road killing 2 in public, be it killing of OBL in Abottabad or be it the attack of Salala directly on Pak army by NATO forces. It is not being emotional, it is to understand what everyone is doing with you. Maybe Maulana Sahab is referring to leader of Southern Pakistan’s party? Dear Zen, great minds think alike !!!!. Very smart. Good timing. He is trying to get enough people to become anti taliban by getting them emotional with his comments, so that the NATO blockade doesnt go through. He is a paid servant of the US. According to Fazlu’s definition Abraham Lincoln, John F. Kennedy, Jimmy Carter, Ronald Reagan are also martyrs!!! By saying this , Fazlu has created space among martyrs for himself if he gets killed by a drone. (aameen). And why your sons are living in US? And you wonder why your ranked lower than N Korea? Anti American blather on parade – long on emotion short on common sense. “Anyone killed by US is a ‘martyr’: Fazlur Rehman” That makes both J. F. Kennedy & Lee Harvey Oswold martyrs as well. Based on his argument, Christians and Hindus are also Martyr even though they are not Muslim. I don’t know Arabic as the common muslims do . The irony of the fact is that each Arabic word has several meanings thereby several definition of JEHAAD can be put forward . To me the confused race of muslims is the result of ambiguity of the Islamic religious scriptures . The time has come when in IT AGE muslim scholars sit together and rewrite Quaran and Hadeeth for the welfare of the future generation otherwise will continue to suffer a lot . Maulana has equated the worthy martyred soldiers, innocent women, children, and men to dogs by calling these beasts as martyrs. What a convoluted and shameful ideology. No wonder, there is no will to overcome these beasts, if this is the level of sympathy and collusion. and now misguiding the populace in the name of religion. If India was united, by now it would have been a world power..
Somebody please tell Fazlur Rehman it was a rhetorical question. and anyone killed my a taliban was asking for it? What a cheap mullah.What is NS’s verdict in this case? i feel he will follow the Maulana as he is also a mullah under the cloak of a democrat.